Friedrich Stromeyer (1776 – 1835) Discoverer of the element cadmium. August 2 is Friedrich Stromeyer’s birthday. Stromeyer was a German physician and chemist who is credited with the discovery of the element cadmium. 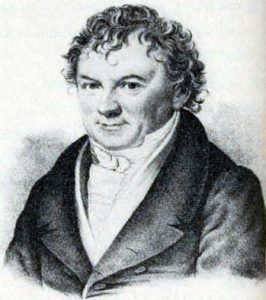 Stromeyer was a professor of chemistry at Göttingen University in 1817. One of the duties of his position was to inspect local apothecaries and their medicines. One of the common medicines of the time was zinc oxide and Stromeyer was investigating a local manufacturer using zinc carbonate to produce zinc oxide. Zinc carbonate (ZnCO3), also known by its common mineral name calamine was a common ore used to produce zinc metal. (Not to be confused with the pink anti-itch medication we know as calamine lotion.) Zinc oxide was a common byproduct of the smelting process. The local supplier of zinc oxide found at sometimes their zinc carbonate would turn yellow when heated as if it contained iron. Stromeyer was called in to investigate. Stromeyer collected samples of the calamine that changed colors and brought them back to his laboratory. He managed to separate a shiny blue-gray metal that turned out to be a new element. He named the element after the Greek name for zinc carbonate, kadmeia. Cadmium is poisonous and restricted for this reason. Prior to the restriction, cadmium was used to make a yellow pigment and as a means to prevent corrosion on steel. It is still used in rechargeable batteries, as a stabilizer in plastics and as a neutron controlling substance in nuclear reactors. All this from Dr. Stromeyer’s discovery. 2012 – Ahmed Hassan Zewail died. Zewail is an Egyptian-American chemist who was awarded the 1999 Nobel Prize in Chemistry for his studies using ultrafast lasers to determine the dynamics of chemical bonding on the femtosecond level. (1 femtosecond is 10-15 second). His technique would pulse ultrafast bursts of coherent light that allowed him to illustrate the transitions of atoms or molecules during a chemical reaction. 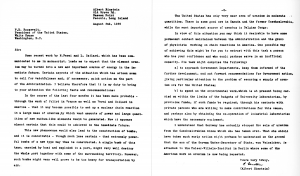 1939 – Einstein writes the Atom Bomb letter to President Roosevelt. 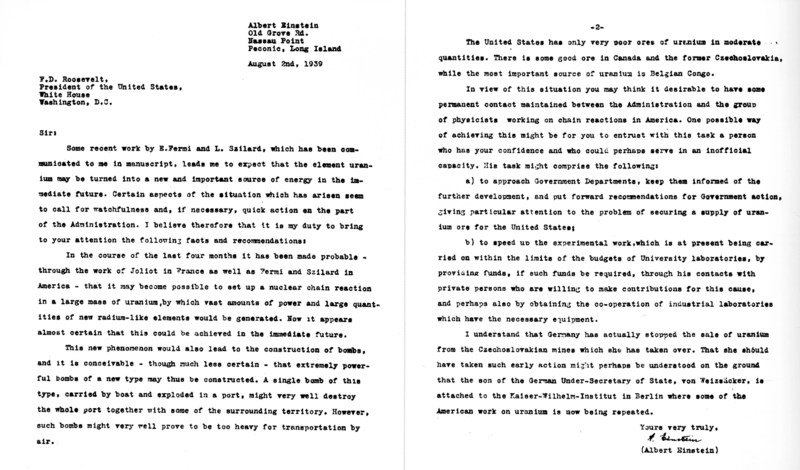 Einstein and Leó Szilárd wrote a letter to President Roosevelt urging the President to investigate the importance of the recently discovered process of uranium fission. They recognized the process could generate a lot of energy leading to power and possibly weapons. There was also concern the Nazi government of Germany was already searching for an atomic weapon. This letter would accomplish little more than the creation of a “Uranium Committee” with a budget of $6,000 to buy uranium and graphite for experiments. Einstein would write Roosevelt two more letters, each urging the U.S. government to put more effort into uranium research. As the war in Europe progressed, the Uranium Committee began to look into the possibility of developing a weapon. When the U.S. entered the war, the Uranium Committee became the Manhattan Project. Einstein would regret sending the letter which he felt led directly to the development of the atomic bomb. 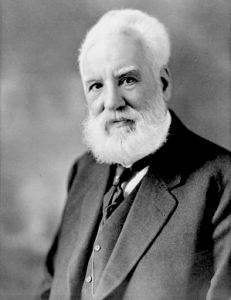 1922 – Alexander Graham Bell died. Bell was the Scottish inventor of the first practical telephone. His primary research was into the study of speech and hearing. His work with the deaf would ultimately lead to the development of the first practical telephone. The actual invention of the telephone came about while Bell was working on a method to transmit multiple telegraph messages on a single telegraph line for Western Union. After Bell patented his telephone device, he offered to sell the patent outright to Western Union for $100,000 in 1879 (almost $2.5 million today). They felt Bell’s telephone was just a toy and had no real value. Within two years, the president of Western Union mentioned if he could get the patent for $25 million, he would consider it a bargain. Bell was also one of the founding members of the National Geographic Society. 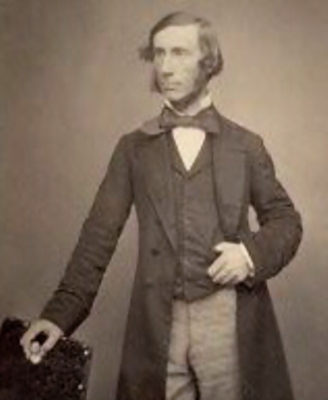 1820 – John Tyndall was born. Tyndall was an Irish physicist known for his discoveries in the properties of air, magnetism, and infrared radiation. He showed several gasses in air absorbed radiant heat or infrared radiation. Water vapor, carbonic acid (carbon dioxide), ozone, and methane absorbed heat on their own better than the atmosphere itself. He showed oxygen, hydrogen, and nitrogen gasses absorbed nearly no radiant heat. He also showed the formation of dew and frost was caused by a loss of heat energy in the air. Tyndall is also known for describing the scattering of light through colloids. He showed the intensity of scattered light is proportional to the fourth power of the frequency of the incident light. You can see this effect by the blue coloring of smoke, motor vehicle exhaust, or even stirring flour into water. This effect is known today as the Tyndall effect or Tyndall scattering. Tyndall became an avid mountaineer while studying glaciers and glacial movement. He was one of the first climbers to reach the tops of several Swiss alp peaks like the Weisshorn and the Matterhorn. Tyndall was also a popular writer and public speaker. He was known for his descriptive lectures and ability to explain complex ideas to unscientific audiences. He published several books explaining science and physics to wide audiences. He also lectured on the separation of religion and science.